The warmer it gets, the more sad I am about (mostly) bidding sweet potatoes a farewell. Luckily, we live in a world where most veggies are available year-round, but I like to shop as local as possible, so during the summer time, I don’t make much with sweet potatoes. 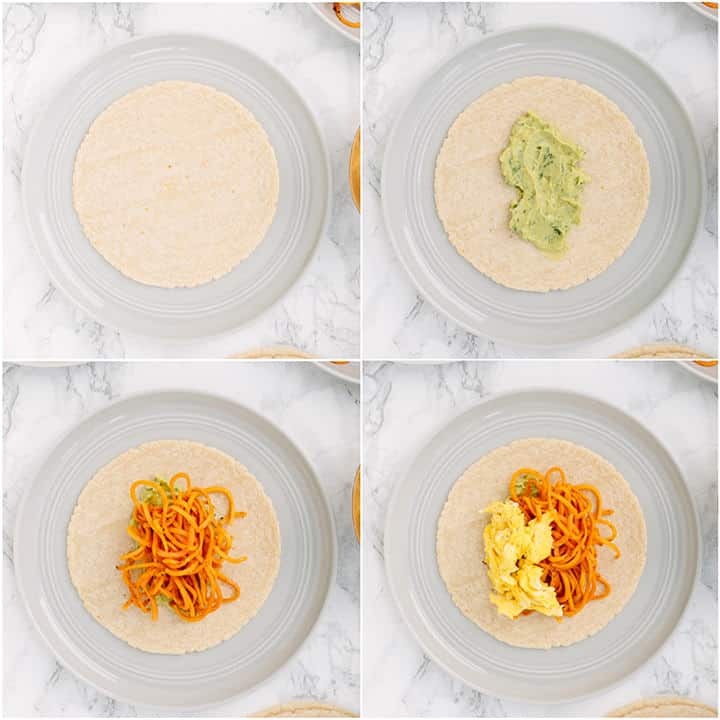 Since we’re not quite at summertime, I figured I’d pack as many sweet potato noodle recipes into this blog as possible, before it’s zucchini time! Of course, spiralized veggie noodles work fabulously as a pasta alternative. However, they can also just be used to reinvent the wheel a bit. 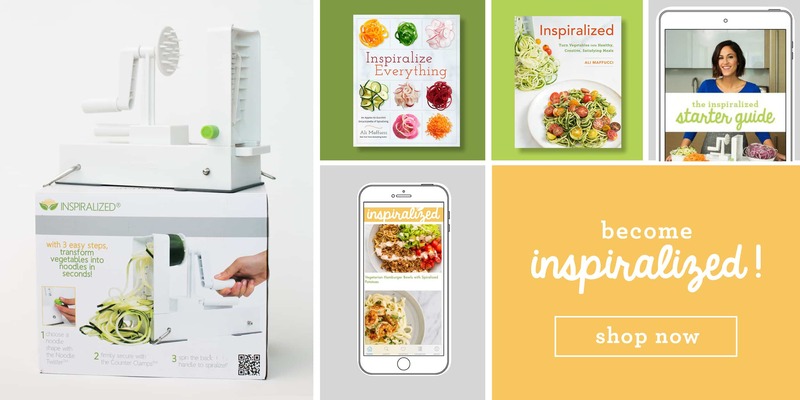 Instead of adding cubed veggies into tacos, why not use the Inspiralizer and make them into noodles? I’m a big veggie taco fan – I can’t ever resist a fried avocado taco, either. When I make my own tacos, I love to jam them full of veggies. But you know what I’m an even bigger fan of? 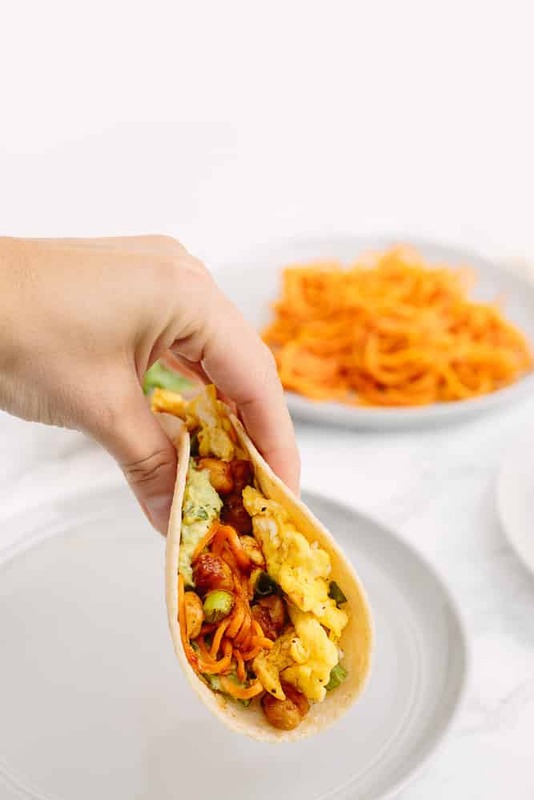 This breakfast taco has it all: veggies, scrambled eggs, avocado, spiralized sweet potatoes, and of course: BBQ chickpeas. I’m often asked how I “make” my BBQ chickpeas so now, the cat’s out of the bag! To make the BBQ chickpeas (that I add to quinoa bowls, lettuce wraps, and obviously – breakfast tacos), I simply combine Tessemae’s Matty’s BBQ Sauce with chickpeas in a skillet or saucepot, bring to a simmer, and let cook until the chickpeas are heated through. You could cook for longer and start to soften the chickpeas more and then mash them for an even better consistency, too! You all know my obsession with Tessemae’s and their BBQ Sauce is my favorite product of theirs and now with summer coming up, I can’t wait to lather up all of my veggies and meats and pop them on the grill! FYI – you can find Tessemae’s products on their website, at Whole Foods and other locations. Check out their website for specific locations near you! I can’t wait to make these again this week when I’m back in Jersey City. This weekend I’m in Boston for my niece’s college graduation (isn’t that crazy? I’m only 29 but I have a niece who’s graduating college?! Spoiler alert: Lu’s 37 and his oldest sister is almost in her 50s). Note: This post was sponsored by Tessemae’s. However, all opinions are my own, always. Place all of the ingredients for the avocado sauce into a food processor and pulse until creamy. Taste and adjust, if necessary. Heat the oil in a large skillet over medium-high heat. Once oil is shimmering, add in the sweet potato noodles and season with salt, pepper, and paprika. Cook until soft, 5-7 minutes, tossing occasionally. Meanwhile, place a medium skillet over medium-high heat and coat with cooking spray. Once pan is hot (flick water and if it sizzles, it’s ready), add in the eggs and scramble them. Season with pepper when done and transfer to a plate and set aside. Immediately wipe down the medium skillet used to cook the eggs and add in the chickpeas and barbecue sauce. Stir for about 3 minutes or until chickpeas are warmed through. If the pan is too hot and the barbecue sauce starts to stick, just stir off heat. 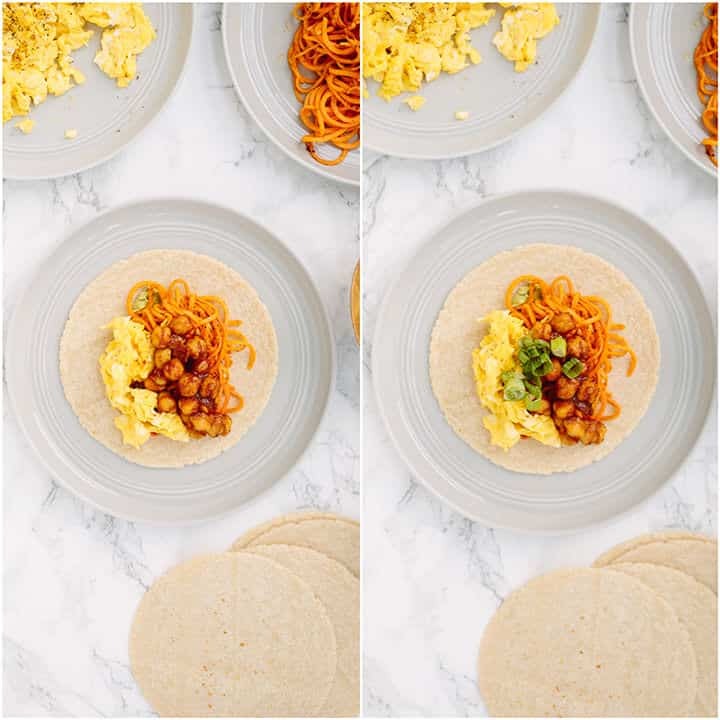 Assemble your tacos: place two tortillas down on a large plate and spread out half of the avocado sauce among the two tortillas. Then, add half of the sweet potato noodles among the two tortillas. 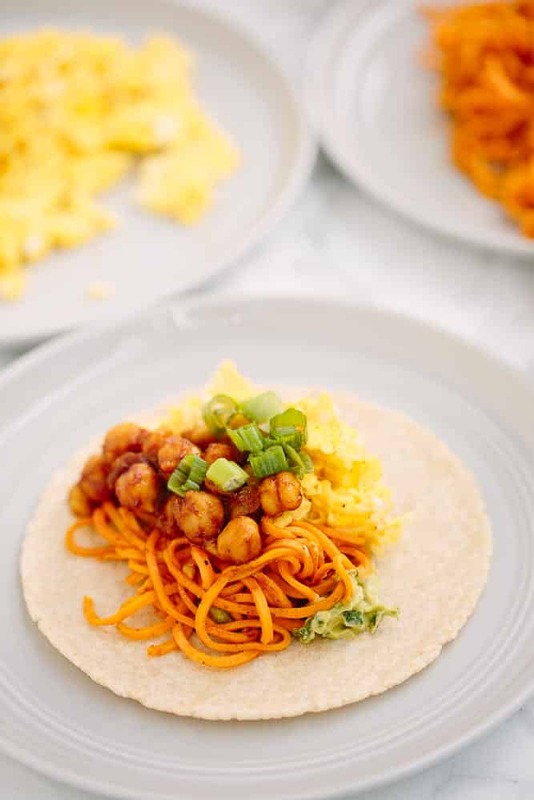 Do the same with the eggs and chickpeas and then garnish with scallions. Repeat until all tacos are done. Serve two tacos per person. Breakfast tacos are a staple here in Austin. Love this one! Oh no no no, I enjoy sweet potatoes all year-round! Even in the summer I will come out with a LOOOOOT of sweet tater recipes! LOL! These tacos could not be cuter--I love that they're stuffed with chickpeas and avocado too!